BEDFORD, Mass., Nov. 27, 2018 /PRNewswire/ — VoltDB, the enterprise-class database platform that powers real-time intelligent decisions on streaming data, today released new test results benchmarking the database platform’s performance against 5G data requirements. VoltDB enables a throughput of more than three million transactions per second with a latency of less than five milliseconds, significantly surpassing the data requirements for 5G systems. The benchmark data reinforces VoltDB’s position as the database platform of choice for 5G deployments. The promise of 5G surfaces challenges for telecom software solution providers as network expectations evolve to transform the supporting IT functions of operational support systems (OSS) and billing support systems (BSS), in addition to the new hardware standards around speed and scalability. Yet most database platforms, such as NoSQL databases, struggle to keep pace with rapid scalability as they typically store and query unstructured data without enforcing the structured concepts of a relational database, ultimately falling far short of the performance and latency requirements at higher scale for modern high-performance apps. 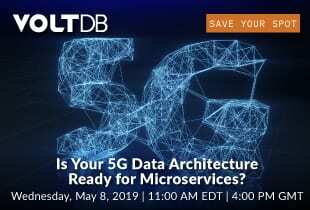 Applications built on VoltDB, whether in telecom, finance, or retail, can be characterized as being horizontally scalable, highly adaptable in complex environments, and reliable in consistency and uptime. A global leader in mobile networking recently tested VoltDB against a NoSQL database from Redis Labs. 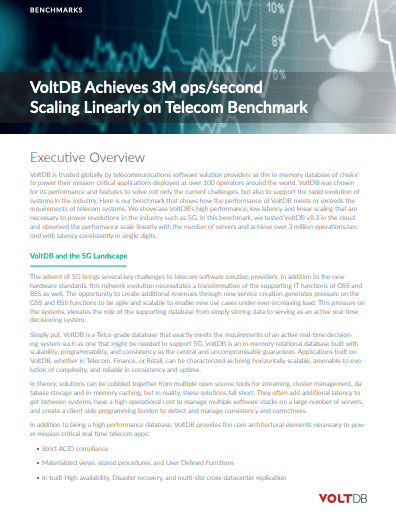 The results showed that VoltDB performed three times faster while using 80 percent less hardware, resulting in an annual savings of approximately one million dollars. The testing consisted of running VoltDB database instances built from clusters of 3, 9, 18, and 27 nodes for ten minute periods and measuring operations or transactions per second (TPS) and 99th percentile latency. Results for each instance indicated more than three millions TPS with latency of less than five milliseconds at the 99th percentile. To perform your own analysis, download the source code of the application from VoltDB’s public repository here.